Mimics the lipid layer of the tear film. 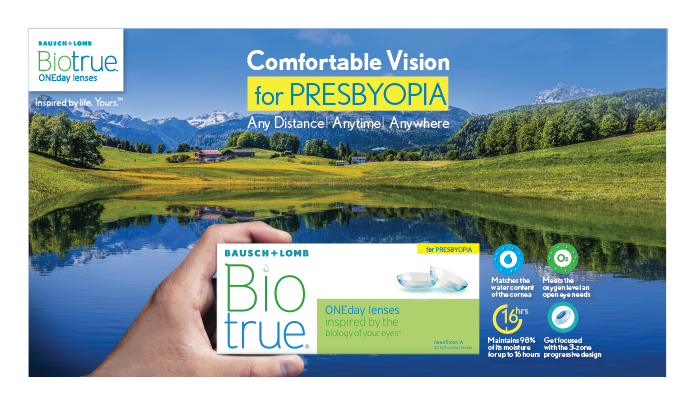 Ask your eye care professional about Biotrue ONEday for Presbyopia contact lenses today. 2. Brennan N. Beyond Flux: Total Corneal Oxygen Consumption as an Index of Corneal Oxygenation During Contact Lens Wear. Optometry and Vision Science. Vol. 82, No. 6, June 2005. 3. Twenty-two subjects participated in a randomized, double-masked, contralateral eye study to evaluate water loss of Biotrue ONEday, 1-Day Acuvue Moist, and 1-Day Acuvue TruEye contact lenses. After 4, 8, 12, and 16 hours of wear, lenses were removed and immediately weighed (wet weight). The lenses were then completely dried and reweighed (dry wet). The percent water loss was then calculated for each lens from the wet and dry weights. 4. Data on file. Bausch & Lomb Incorporated. Rochester, NY; 2015.